I haven’t done this before, but it just sounds so different I had to post. 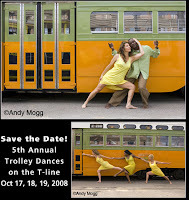 Epiphany Dance is putting on its 5th annual Trolley Dances: “A Freewheeling Festival of Modern Dance” in San Francisco on October 18-19. (Thank you Relli for the tip). Hop on the MUNI T-line and take a roundtrip tour between the Mission Bay area and Bay View Hunter’s Point. 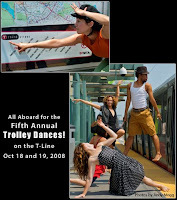 Along the way, you’ll stop a few times, to get off the bus and watch site-specific modern dances. There’s some walking required to reach the sits (they’re wheelchair and presumably stroller accessible). Where: begins at the new Mission Bay branch of the SF public library, 960 Fourth Street, at Berry. What: 2 hour guided tours leave every 15 minutes, starting at 11 a.m., with 6 performances over the two days (11, 11:45, 12:30, 1:15, 2, 2:45).